Researched, designed and constructed by a genuine Oregon "Back Country" Horsewoman, these are two of the most rugged and useful saddle bags you will find anywhere & comes with a lifetime warranty. The versatile twin heavy-duty Day Saddle Bag is designed to be used either on the pommel horn or behind the cantle seat on a Western saddle. On English & Endurance- type saddles, it fits handily sandwiched between your saddle & the pad. As a bonus, the pommel hole also fits perfectly over a motorcycle gas cap! Each Day Saddle (Pommel) Bag bag is 11" tall X 11" wide X 4" deep. Weighs 2.5 lbs. So waterproof they can hold water in a pinch, they're abrasion-resistant and constructed of rugged 1000 denier Cordura nylon. 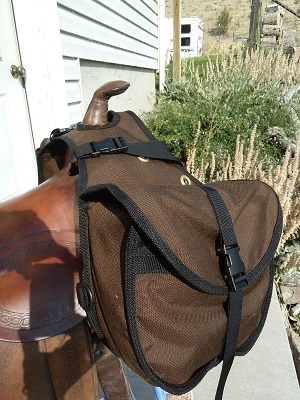 They have correctly placed 1/2 " brass grommets, and three 1" molded nylon D rings that enable you to secure the bags to a front or back girth with 2- 40" lengths of 3/16" nylon string, preventing bounce at a trot or gallop. Full-flap closures allow you to fill bags to the maximum, still keeping items secure. Heavy-duty 4" Velcro holds flaps closed until buckled. 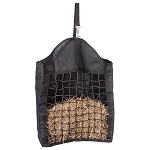 1" black nylon webbing runs under and around the bag and over the flap where it buckles with a 1" nylon slide-release buckle, eliminating any pull on the fabric. All edges are bound with 1' nylon webbing. Across the reinforced top, two 1" black nylon straps with slide release buckles allow you to carry a jacket, slicker or bedroll and to tighten & remove them while mounted in the saddle. Built into each bag's double- wall construction is an outside pocket, with a nylon self-repairing molded tooth zipper and double-bound seams for securing small items, like keys. Proudly made in the USA by Garden Horse Upholstery NOTE: The Upholsterer will be on vacation the week of Thanksgiving, 11/18- to 11/26. All Garden Horse Upholstery products come with lifetime warranty you won't find everyday. If the construction of the bag fails in any way, just send the bag back to the maker for repair, free of charge. Personally tested & approved by Trail Pals employees. We love these saddle bags!